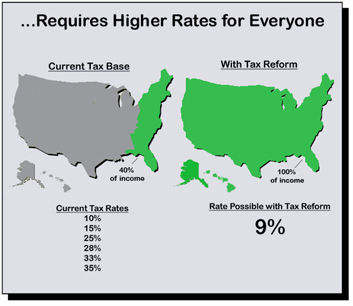 The current system requires six tax rates ranging from 10 percent to 35 percent to raise the $912 billion in federal individual income tax revenue expected in 2005. That amounts to an average tax rate of 19.5 percent. If all personal income were taxed instead, the same revenue could be raised with rates ranging from just 4 percent to 17 percent. That would amount to an average tax rate of just 9 percent—less than half the current effective rate. Chairman Grassley is right: tax credits are popular. But sound tax policy requires rising above politically popular measures and instead allocating the public treasure wisely. There is no reason to support measures that provide short-term gain but ultimately damage the economy in the long term.